"Arguably the finest estate publicly offered in the Newport Coast, 7 Pelican Vista showcases timeless beauty and design around every corner with unparalleled views of Newport Harbor, California coastline, and the Pacific Ocean with Catalina resting in the backdrop. At just over 11,600 sqft with over 3,000 sqft of covered loggias positioned on a peninsula lot just under 30,000 sqft this estate boasts 5 full suites, 11 bathrooms and every amenity one could wish for. From the moment you enter the estates front gates through the sunken Italian gardens you are transported to the most private property in the community. Throughout, custom millworks, Fine wood and stone floorings, exquisite moldings crafted by artisans and adorned with authentic antiques and bespoke furnishing, artifacts and art this property is built for the most discerning clientele. The grounds offer amenities stretching from the JBL Home theater, billiards room and multiple spas to heated floors, automated shades, and state of the art security system just to name a few. To fully comprehend the quality and craftsmanship this estate must be viewed with the naked eye. 7 Pelican Vista epitomizes coastal resort living with no expense of authentic detail spared." 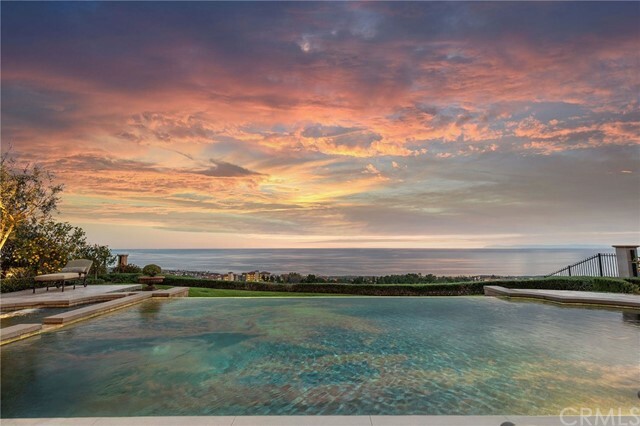 "Villa Papillon (Butterfly Villa) is perhaps Pelican Hill s most inspiring estate. 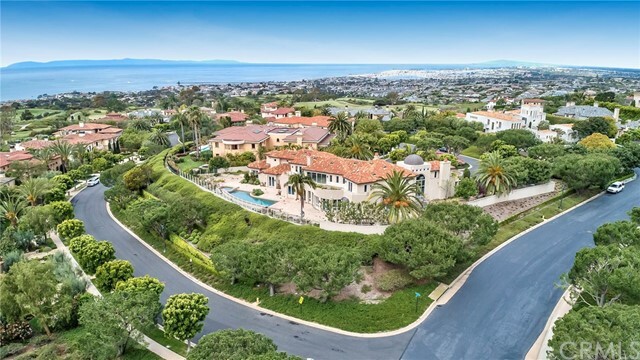 Spanning an exceptionally private double lot for 228 feet of prime view frontage, this residential masterpiece captures views stretching from Newport Harbor to Catalina to Palos Verdes. Live and entertain on a grand scale - indoors and on the expansive grounds - in spaces evocative of the world s finest hotels. Every finish and fixture has been hand-selected for lasting quality and beauty - from Murano glass chandeliers, opalescent Venetian plaster and rare blue slab onyx to 24-karat gold Sherle Wagner faucets and Greek Thassos marble with pearl inlays. Highlights of this exquisitely light and bright estate home include a red velvet-upholstered, state-of-the-art theater; a cabana room inspired by the Polo Lounge at the Beverly Hills Hotel; a beautifully appointed cocktail and cigar bar, and a breathtaking master wing with full spa bathing suite and dual designer-boutique influenced dressing rooms. The grounds includes an abundance of covered, heated loggias with media amenities and fireplace, pool and spa, koi pond, play area, volleyball court, outdoor pavilion kitchen and dining area. An elevator and subterranean 3570 square foot finished showroom garage complete this iconic property." "Welcome to this exemplary estate in exclusive, guard-gated Pelican Crest, showcasing the finest of the coveted Southern California indoor-outdoor lifestyle. Reminiscent of a fine resort, the grounds include meticulously-manicured landscaping, stunning infinity edge pool with connected wading pool, separate spa, and an entertainer s dream barbecue area with a swim-up bar and bar seating. Other outdoor amenities include a peaceful koi pond with tranquil cascading water feature, built-in fireplace, fire pit, putting green, and expansive views overlooking the coastline, city lights, and Catalina on the horizon of the sparkling Pacific Ocean. Inside the expansive estate stands a custom chef s kitchen complete with professional-grade appliances, custom cabinetry, and a large island with eat-in bar seating, integrating seamlessly with the living and entertaining spaces. The upper level is host to an office, home gym, and the unparalleled master retreat, which features a sitting area, private terrace with built-in fireplace, spa, and seating, generously appointed walk-in closet, and a spa-like master bathroom, complete with dual-headed shower, separate therapeutic tub, and his and hers sinks and vanities. Topping off the amenities of this remarkable estate are the motorcourt, 4-car garage, wine room, bonus room with integrated bar, and amazing location close to all of Orange County s world-class offerings complimented by the peaceful setting of Pelican Crest." "Positioned on the front row of one of Newport Coast s most exclusive private neighborhoods in Pelican Crest, this estate abounds with luxurious amenities throughout. With views stretching past Newport Harbor up the California coastline to Palos Verdes all the way to Catalina with year round sunsets in the back drop this home epitomizes coastal California resort living at its finest. Built by famed custom home builders Rodeo Homes and at over 12,000 sqft the estate offers 6 bedroom suites and 6.5 bathrooms. Upon entering the grand two story foyer you are greeted by the office/ library and formal living room. Down the great hall the rest of the main floor includes media room, informal living room with sunken bar, formal dining room, gourmet kitchen with breakfast nook, guest suite and powder. The upper level contains master retreat, secondary bedrooms and secondary laundry. The lower subterranean level hosts full sized sport court/ event space, main laundry, gym, sauna, steam shower, home theater, 2170 sqft garage, and open air courtyard. The grounds of the property showcase quality hardscapes and lush landscapes all surrounded by unparalleled views." "This is it! The home with the view in the private gated community of Pelican Crest, on the highly sought-after front row Avalon Vista, is available. Mst. includes separate water closets, bath facilities and closets, covered terrace, and a separate sun deck retreat. This home boasts of four spacious bedrooms with in-suite bathrooms plus a spacious powder room. Enjoy hosting parties with an elegant living room, dining room, large open great room, game room, full room bar, professional kitchen with two islands, two dishwashers, Sub-zero and Wolf appliances. Catering needs are fulfilled by a separate catering kitchen with a butler room and exterior access. A wine room that holds over 500 bottles. No expense has been spared with finishes including: Walker-Zanger, Ann Sacks, hand finished tongue and groove walnut floors, Italian travertine stone, custom imported Italian hand carved limestone fireplaces, Grohe and Waterworks faucets, Carrera marble, Fine Art lighting fixtures, Crestron home system including mood lighting and sound, custom Italian fabric window treatments, etc. Feel the warmth of Italian gardens in the elegant lot with nine mature olives trees, outside fireplace, loggia, courtyard, water features, Lynx grill, serving and eating granite counters, jacuzzi that seats 12, and full-size infinity pool with blue polished glass bottom finish that looks like the ocean. There are many more features for enjoyment." 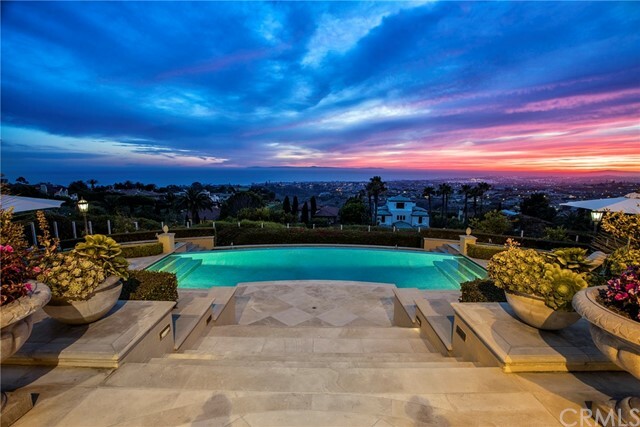 "Dramatically positioned high in Newport Coast, this Mediterranean-inspired luxury estate features an unparalleled 50-mile panoramic ocean view from Catalina Island straight to Palos Verdes. Nestled inside the exclusive, 24/7 guard-gated community of Pelican Hill, this private sanctuary rests on an exquisite, landscaped half-acre of land just minutes from the beach. The manor spans 9,200 sq. 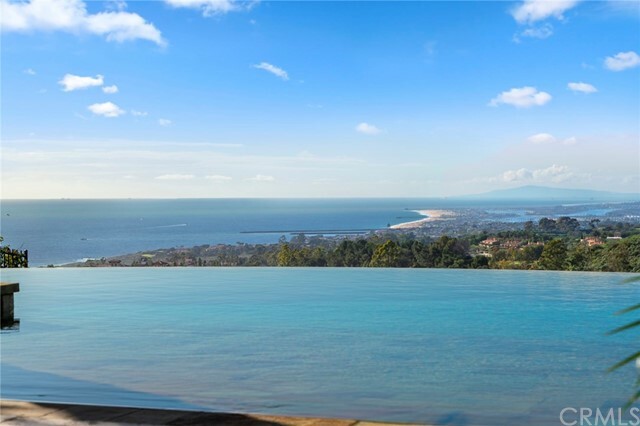 ft. over three levels, and offers 5 vast bedroom suites, 6.5 baths, and a dazzling array of amenities, including a gourmet kitchen, library, theater, and an infinity pool overlooking the coastline. The residence marries a timeless blend of Spanish and Italian details with modern smart home capabilities. Among the architectural and design triumphs are a heavenly-sized rotunda upon entrance, soaring coffered ceilings, and marbled floors throughout. The large and lofty master suite comes complete with a spacious sitting room, private balcony, and a lavish spa retreat towering over the bright blue vista. Thoughtfully designed to frame the gorgeous views, the open floor plan widens to the covered patio with outdoor dining area and extends into a meticulous courtyard where guests can savor the feeling of lush serenity." "Floating on a front row type setting this stunning Crystal Cove estate residence blends the romance of classic coastal architecture with the timeless appeal of traditional finely appointed interiors and spectacular ocean views. Set on a spacious, gated, approx. 22,578 sf lot with lush landscaping including specimen trees and abundant seasonal florals, the home and guest house are exceptionally private. The main residence encompasses approx. 8,096 square feet, 5 bedrooms, 6 bathrooms and powder room, with finishes and amenities hand-selected for beauty and quality. Designed to maximize the views of the Pacific, coastline, whitewater and Catalina, the home features high-ceilinged rooms suffused with natural sunlight that flow from one to the next and out to the exquisite grounds. Ideal for outdoor living and entertaining, the home offers covered loggias and terraces, sunny courtyards, lawns, pool/spa, outdoor fireplace and water features. Interior highlights include an entertaining suite with formal living and dining rooms a kitchen suite that spans a chef s kitchen, 2 butler s pantries, breakfast room; family room with fireplace; library/ study; playroom; master suite with, sitting room, fireplace, 2 dressing rooms and spa bath. All within guard-gated Crystal Cove." 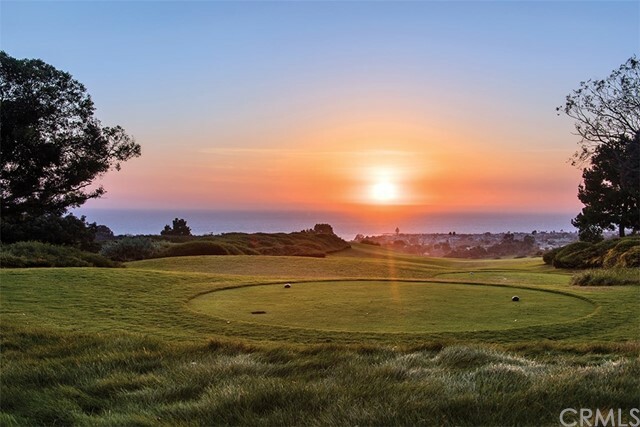 "Located within Newport Coast s exclusive private neighbor of Pelican Hill and prominently positioned off one of the communities most coveted ocean view streets, 5 Premiere Point represents southern California resort living at its finest. From the moment you enter through the courtyard gates passing the detached two-story guest house leading you to the palatial foyer and entry to the finely appointed back yard showcasing sweeping views of Pacific Ocean, Newport Harbor and Catalina resting in the backdrop, you find quality and craftsmanship around every corner. At 8524 sqft with 5 beds and 6 baths this estate hosts every amenity one could desire. The main level offers Formal living, formal dining with pocket doors to the front courtyard, executive office with private patio, guest suite, 1143 sqft garage, laundry, powder room, chef s kitchen with breakfast nook and expansive great room with fireplace, bar, and ocean facing pocket doors leading to the back yard. The upper level holds the master retreat with oversized spa bathroom, large walk in closet, sitting area with fireplace and folding doors leading to a massive covered ocean view terrace. The upper level also contains common area study/ lounge space, theater room, and two secondary bedroom suites. Outside, the properties grounds boast premium hardscapes, lush mature landscapes, water features, courtyards, fireplaces, Outdoor dining, covered BBQ pavilion, Infinity edge pool & spa, and views as far as the eye can see"
"Tucked behind a private gate at the end of a quiet cul de sac, and resting on an ocean-view lot of well over one half acre, this sprawling 4 bedroom, 5 bath Tuscan-inspired residence offers nearly 6,300 sqft of interior living space, plus an additional 1,500 sqft of covered outdoor living space, and lives mostly on the main level. The eat-in gourmet kitchen is the hart of the home with ample room for a dining table plus a large center island. An adjacent living area opens on one side to a central courtyard with lively fountain, and on the other side to a covered patio with fire pit. The main floor master suite offers coastal views and a spa-style bath with dual walk-in closets. Detached guest quarters and a professional quality home theater round out the main level. The 2nd floor includes 2 bedroom suites, a media room and ocean view loggia with fireplace. The 3rd story loft is perfect for a home office, workout room or art studio. In the expansive backyard, enjoy a grassy lawn, sparkling pool and cabana, complete with outdoor kitchen. The guard-gated community of Crystal Cove has much to offer its residents and guests, including the 2.5 acre Canyon Club for swimming, tennis, work-outs, entertaining and meetings. There are also parks, greenbelts and hiking trails. Conveniently located just outside of the community gates, the Crystal Cove Promenade includes many casual and upscale options for dining and shopping. Crystal Cove State Beach sits just across Pacific Coast Hwy." "This Pelican Hill residence welcomes you with sweeping views of the Pacific and the Pelican Hill Golf Course and Resort. With the timeless ambiance evocative of an estate in Santa Barbara s Montecito district, the home s warmly inviting spaces are clad in beautiful, neutral tones and finishes and abundant natural light. Designed for effortless indoor/outdoor entertaining, the generously scaled rooms open to numerous loggias and terraces, the grounds, and the spectacular views. The estate encompasses six bedrooms and eight bathrooms, including an optional on grade secondary master and detached guest casita. A lovely master suite spans the entire upper level with an expansive ocean and golf view terrace, indulgent his and hers bathrooms and dressing room, and adjoining office or nursery. The rear grounds feature a sparkling saltwater pool and spa, a fire pit, spacious heated loggia, and a shaded pergola dining room with media, heaters and barbecue. Other noteworthy highlights include a true chef s kitchen, wine cellar with wine dining + tasting room, separate staff quarters, private motor court and garaging for four cars." "REDUCED to almost $2.5M FROM ORIGINAL ASKING PRICE! The ultimate expression of Southern California living, where classic meets coastal, where traditional & modern are naturally entwined, this meticulous estate in Orange County s preeminent luxury enclave -Crystal Cove- offers resort style living at its finest. With views of the Pacific Ocean & its majestic sunsets, this nearly 7,700sqft property offers beautiful & refined details throughout, creating a timeless interpretation of classic design & style. Generously appointed with 4 bedrooms & 6 bathrooms including dual master suites, the spacious floor plan opens to patios, courtyards, & terraces that capture ocean views. The amenities & rich materials include handsome stone and brickwork, custom ironwork, white solid oak flooring, antique glass, lutron & pendant lighting throughout. The professional kitchen features Italian & Calacatta statuario marble counter tops, hood surround, Sub-Zero refrigerator, & butler s pantry. The basement level promises memorable entertaining with media room, wet bar, wine cellar, & fitness room. Upstairs, the master suite has an extraordinary walk-in closet & dressing room with envious ensuite bath. Tranquil & private thanks to its prime location on the 2nd smallest street in Crystal Cove, the grounds include a pool, spa, outdoor bbq & fireplace, ideal for entertaining. Other highlights include elevator, smart home technology, & world-class Crystal Cove amenities." 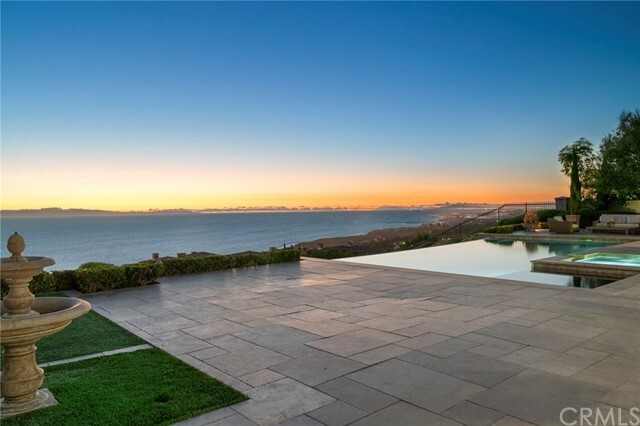 "Located on one of the finest lots in Newport Coast's private, gated community Pelican Point, this estate epitomizes the best aspirational oceanfront living. Like it's 12,000 square foot lot, this resort inspired residence is also generously dimensioned with 7135 square feet, three bedroom suites on it's upper level, one bedroom suite on the main level, and an optional fifth bedroom suite in the subterranean level that is currently being used as an in-home gym and spa. Evoking California coastal elegance with upholstered wall coverings, rich window coverings, walnut floors and fine limestone throughout, the home's interiors complemented the property's expansive grounds. A thoughtfully placed blend of lush, mature landscaping, quality hardscape, private enclosed courtyard covered loggia, salt water pool, spa and water features. A short distance away, the community's private gated access point to Crystal Cove State Beach offers residents miles of California's premier coastline, world remounted surf and walking/hiking trails." 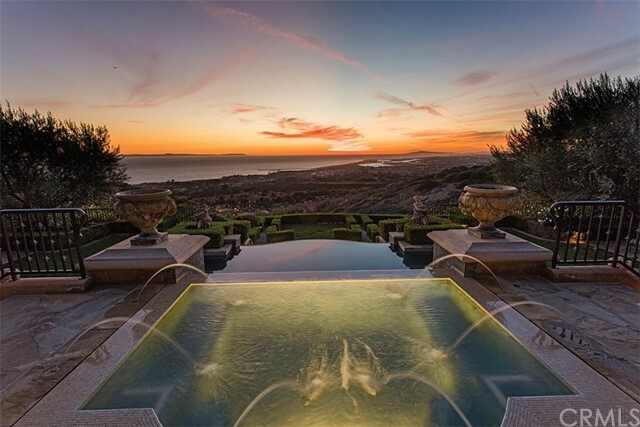 "Located in Newport Coast s private gated Pelican Hill community this palatial estate offers everything one could desire. Positioned at the end of a cul de sac the property offers the upmost privacy and grants a unique amount of space between neighboring properties on either side lending to the tranquil setting. Once through the front gates and courtyard/ motor court you are greeted by the grandeur of the sprawling two story open foyer with wrap around staircase leading you to the formal dining room, living room adorned with cast fireplace, guest bedroom suite and rich wood clad library. At approximately 8,000 sqft the estate offers 4-bedroom suites and 5.5 baths. The main level hosts recently updated gourmet kitchen and butler s pantry, ocean view media/ lounge space, sunken bar, wine cellar, indoor pool, laundry, powder room and three car garage. The upper level contains the master retreat, two-bedroom suites, and landing overlooking the foyer. Once outside the exquisite hardscapes, outdoor dining, wood burning pizza oven, BBQ area, and lush landscaping lead you to the unparalleled views of the Pacific Ocean, year-round sunsets with Catalina resting in the backdrop." "Savor breathtaking ocean, golf course, and Catalina Island views from this spacious 7,300+ square foot residence in the prestigious guard-gated community of Pelican Hill. The pause on an existing renovation has rendered a blank canvas within the highly coveted community an ideal opportunity for the design perfectionist to create their dream estate. The shell for this luxe residence accommodates six bedrooms, six and one-half bathrooms, and boasts soaring ceilings, formal and casual living spaces. 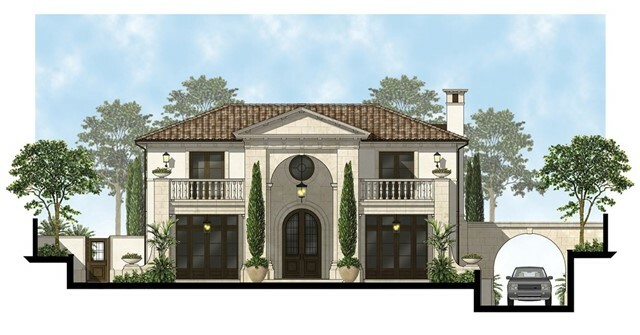 Architectural plans designed by renowned architect James Conrad, and interior design concepts by Becki Owens, are included with the sale and feature bright and airy transitional living spaces fit with custom tiling, statement light fixtures, a neutral color palette and varied textures for a stylish aesthetic that borrows inspiration from the best of Modern Farmhouse, Moroccan and Coastal Contemporary design. Situated on an approx. 21,000 square foot lot at the end of a cul-de-sac, the residence benefits from expansive outdoor living that includes wrap-around patios, courtyards, pool/ spa, and spacious driveway all set behind private motorized gates. 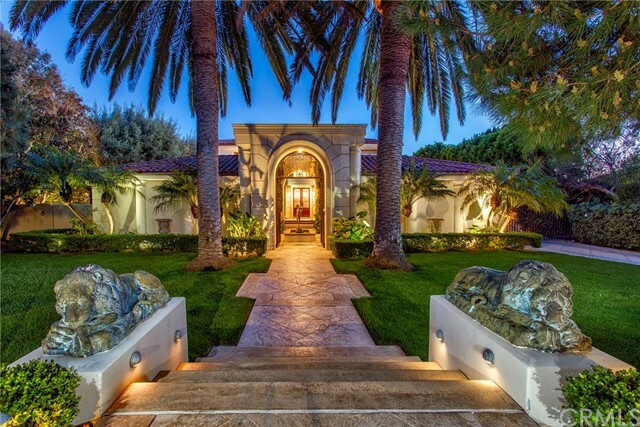 Located close to championship golf courses, Crystal Cove beaches, John Wayne Airport, five-star shopping and dining, this distinguished estate hits all the marks. Property sold as-is." "Gracefully situated on an exceptionally large parcel of land in Pelican Hill, one of the most prestigious communities on the West Coast, this award winning, home has been tastefully designed by EBTA Architects, and boasts approx. 6,030 sqft. of completely remodeled living space enhanced by 18 ceilings and complemented by an open-concept floor plan. An oversized motor court in front of the home provides ample parking for guests while a grand foyer adds a level of luxury and elegance on par with the world famous resort just down the road. 5 bedrooms, including an elegantly appointed junior master bedroom on the main floor, are complemented by seamless transitions between the family room, kitchen, and formal dining areas, while a full service elevator transcends both levels of the house, providing easy access to every corner of living space. An executive office complete with custom, built-in cabinetry allows one to enjoy tranquility and privacy within the comfort of your own home. An entertainer s backyard, complete with an outdoor bbq and seating area, provides an ideal backdrop for picturesque ocean, harbor, and city light views. Close proximity to championship golf courses, Crystal Cove Beaches, and Orange County s premier shopping complete this dream estate." 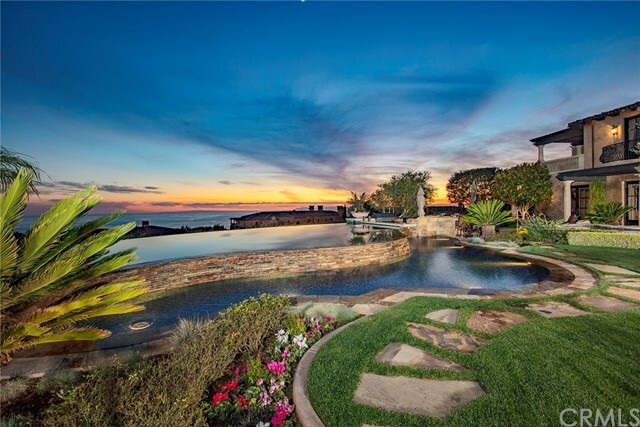 "Hidden within the prestigious guarded gates of Crystal Cove, this rare single level estate offers ultimate privacy and stunning views of the Pelican Hill golf course, reaching out to Catalina Island with no rooftops obstructing the amazing ocean view. Secluded at the end the Timor Sea cul-de-sac, on a oversized lot, neighboring only one home. Wide double doors offer a welcoming entry to the great room, highlighting impressive pass-through views of the backyard and beyond. Each detail throughout has been carefully hand-selected, from the origin of stone and woodwork to the custom twelve foot live edge floating shelf, and the calmly focused sound of water just outside the office. A sprawling backyard made for entertaining, offering an outdoor fireplace, built-in bbq and bar, newly done impeccable landscaping, a new refinished, very high quality pool and spa. The master retreat hosts ocean views, a fireplace, a separate massage room, en suite oasis-style bathroom, and spacious walk-in closets. The tower-top casita features an en suite bath and balcony, overlooking the property s entryway with it s own private entrance. A hallway lined by dual wine walls marks the path to a true chef s kitchen, with professional grade appliances, an expansive island, and a large butler s pantry. Including five different cozy fire places, two of which being on the exterior of the home. Offering more than could reasonably be represented by words, this unparalleled estate is immaculate in detail."